Hey folks, the Sun is attempting to conduct an opinion poll on the N.Gateway. Illustrating on dimension of the Harper Regime, David Bruser at the Toronto Star does a very good job of illustrating the impact of Afghanistan war on some veterans of that war. You know, it takes a particularly wicked and sadistic mind to keep someone in a trauma-inducing situation for no reason, and then deny them the care when they afterward. The impact of industrial war on soldiers has been known for almost a century now. The government does not have the option of saying "we didn't know this is what Afghanistan would do." The information is widely available. Therefore, exposing soldiers to war without good cause, and then reducing or denying their care afterward is an act of abject cruelty. If the Geneva Conventions were applied, this would be torture and therefore forbidden. In yesteryear, this would be an hanging offence if people were shown to have died as a result. This Harper Regime, which has destroyed the lives of so many young people is now trying to give itself the power to legally rig elections after it got caught stealing the last one. In a just world, attempting such a thing would grounds for a long detention or some kind of banishment. ...Such a treasonous act undertaken by the government itself is something that requires more than rarefied political discourse. People have to be woken up to the dangers of an encroaching fascism, to a government that is attempting to gradually replace our democratic system with an autocracy in which any democratic processes have been rendered exercises in futility, and where, by extension, the government serves a narrow corporate interest and a small percentage of wealthy patrons. It is difficult to live in a society which is inching gradually toward autocracy as many of the citizens seem to blithely ignore the coming danger. There is a certain nonchalant attitude taken by many to the dangerous and insidious actions of a government that is falling into fascism. They have trouble believing that it "can happen here" or that our traditions can be subverted and perverted by a bunch of men dressed in suits. But not every coup is a violent one and sometimes what is best in a society is lost in a quite war of attrition. The Liberals won't call what Harper is doing "fascism" for two reasons, both of which have to do with what they see in the mirror. First, they haven't the balls because they still think Canada is a "nice" country and using that word to describe the Harper regime is too uncomfortable and impolite. Second, they'd have to confront their own ideology which likes trade, markets, and the private sector, albeit with a little more professionalism than the outright malicious thuggery of the assholes currently holding the reigns. They really believe in thuggery. The NDP won't use it because they haven't the balls either and are moving closer to the centre. A bit of power in a one-off election and they want more. Getting more means drawing votes away from the Liberals. Drawing votes from the Liberals means looking more like the Liberals. Looking more like the Liberals means looking wet. Meanwhile, the Harper fascists will legislate themselves into perpetuity and we'll be nice enough not protest too much and upset things. Here's a popular press description. A few comments. We should be careful. I mean something like this confirms what most of us suspect about our rightwing ghouls (including the parliamentary trolls in the Harper gov't) and shows us the best thing to do is not engage. There's really no rational argument to make against psychotic sadist. Second, this isn't confined to lunatics on right. I dare say there's a few so-called progressives who might fit some of these descriptions, particularly those who abuse discourses that foreground individual identity or identities to the point where they dehumanising and humiliate others. The lesson? Obviously, do not feed the trolls. I want to add something to the outstanding series of posts from Dave this week. Harper wants to change Canada into some kind of theocratic fascist petro-state, complete with dead coasts and rivers, impoverished workers, and rigged elections. This much is clear when we look at the indicators and EVERYTHING he and his party do should be viewed through this lens. The man is at war with his own country. To do this, to reform Canada, Harper must destroy everything Canada is and this includes best of what Canadians do and think about themselves. He has broken the back of parliamentary accountability, public science, now Elections Canada, environmental assessment, the census. Destroying elements of responsible government allows his party total political control over the practice of government. This is a systematic and strategic strangling so that no public entity may say or do anything that goes against the wishes or potential wishes of the Conservative Party. 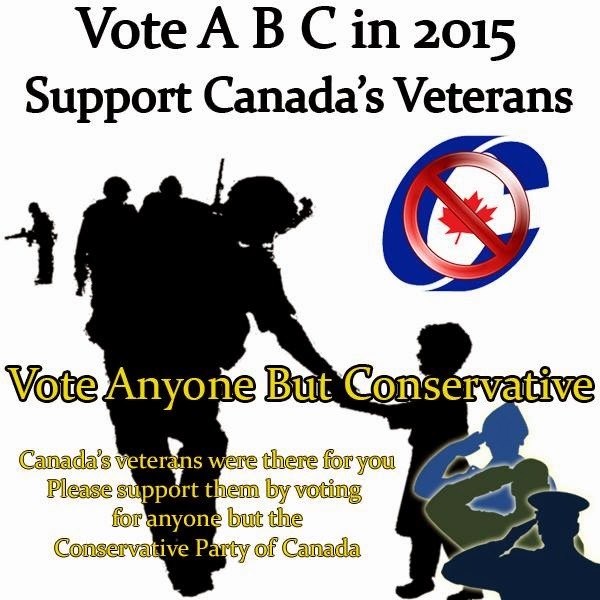 This includes veterans and the serving Canadian Forces. Anyone who has served will understand the selflessness and professionalism that the finest of Canadian service members have to offer. Ours is not a military that will readily serve a corporatist god-bothering oil fiefdom, at least once this reality grows undeniable. Harper and his ilk must break the Canadian Forces and its veterans and reform it into something more subservient and to their liking. How would he do this? Destroy their security and well-being, break their morale, divide them, the same way he's attacked every other public service he needs to control and the public itself. Show them their years of service and sacrifice count for nought. The smart ones will understand this and Harper might hope they will protest to no avail or be bought off, and then fade away like so many silent government scientists. The smart ones understand that the professions of soldiering, sailoring, or flying aren't dependent on the aesthetics of a particular uniform or badge, but on tradecraft. That's why the military continued to function and perform after unification and throughout more recent dark periods. When push comes to shove, the craft is what counts and it this pride that drives protests against Harper and his little Fantino. Harper needs to break this. At the same time, lest this protest movement from the veterans spread, he needs to something to produce the kind of soldiers suitable for teh Harper Army. The return to preunification ranks fit with this. Playing on an ancient sore scores points with with certain elements. The return to preunification nomenclature and symbolism divides the military and veterans between those who are easily distracted by nostalgia and baubles and those who understand that warriors are defined by their cohesive fighting ability and would fight in pink leotard if that's what was issued. The latter type of person doesn't have an home in the Forces that Harper needs. It wouldn't be surprising to learn that Fantino was deliberately late to that meeting with veterans to ensure they knew who was boss - not that it ultimately went that way. If Harper manages to buy off the angry veterans or they fade away, he stands gain a split between the public and the military which would only serve his interests when it comes to using the armed forces against the public when we protest. He's already enlisted the spies. Veterans are outraged. Now they need to do what they once did best. Lead. Part 1. There is no doubt Canadian veterans have been treated in the most vile way possible by one of the most ignorant people in the Harper government. Julian Fantino has demonstrated, quite clearly, that he feels a greater duty to his benefactor, Harper, than he does to the armed services veterans his department is mandated to assist. In fact, his recent behaviour demonstrates a total disdain for veterans. He believed he could appear at a time of his choosing and start issuing orders. This to a group who, now no longer in uniform, would loudly tell a serving general where to go if they didn't like what was being said. Fantino forgot, (or perhaps has never understood) who it is he actually works for. Not surprising, actually. Fantino has a long and documented history of being a dangerously stupid person with too much power which he felt was his to abuse and then to attack anyone who shone a light on his activities. Some people are giving Fantino credit for "sincerely apologizing" to veterans for the spectacle he created. Except that it wasn't a sincere apology and accepting any part of it would be a huge mistake. Professor Stephen Kimber explains why. Sincerely? 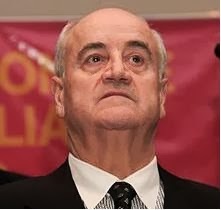 In the next breath, Fantino was bitching to his stenographers at the Toronto Sun that the multi-medalled, wheel-chaired vets had been “duped… jacked up” by the union representing public servants who will lose their jobs and who had paid the veterans’ airfare to Ottawa. Keeping in mind, of course, that on one of Fantino's previous yap-sessions with those same stenographers he tried to paint himself into the same frame as a combat veteran. That should have told the veterans who attempted to meet with him that such endeavours were likely to fail. Fantino, who does not know how to control his authoritarian impulses, views himself as a hero. A self-styled hero who brooks no protest without his explicit permission. Fantino clearly does not understand veterans. Worse though, is that he expects veterans to kneel before him and then be grateful for his very existence. His style is to issue orders; not to listen. And he further insults veterans by telling them they have been "duped" by the public service union, PSAC. Really? Duped by the very union veterans watched like hawks when they were serving? The same union whose collective wage and benefit package formed the basis for the Canadian Forces compensation and benefit negotiations with the Treasury Board? Ya think?!! If there's been any "duping" going on it's been by Harper and company, Fantino included. They have made a point of positioning themselves as "friends of the forces" and the "protectors of veterans", all without having done much except make loud noises about it. While the Harperites have been diligent in making certain they applied a nice shiny surface paint job, they have been hacking away at personnel, cutting pay and benefits, cancelling equipment acquisition and fighting against veterans attempting to hang on to disability benefits. Not to mention the biggest duping of all. Harper, on Sunday, 1 March 2009, on CNN in the U.S., (he never says this kind of thing where a Canadian can get at him), told Fareed Zakaria that the war in Afghanistan was futile. And rather than call the Chief of Defence Staff and require that all Canadian troops be withdrawn to a safe area, he continued to knowingly send Canadian kids to their death. That made them cannon fodder and it highlighted Harper as a dangerous sociopath. Fantino too, is a sociopath but with perhaps a more lingering aroma of corruption. And here ends part 1. Industry Canada (and by extension the Conservative government) is apparently so afraid of public opinion (and the internet) that they have a 12-step program process for issuing Tweets.